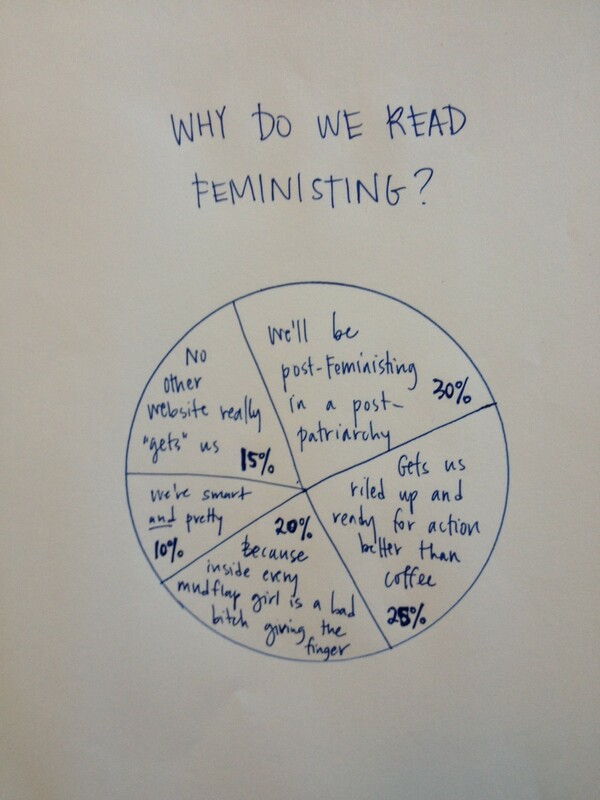 Pie chart: Why do we read Feministing? Donate to support the Feministing #TimesTen relaunch here. If you’re feeling really generous, I’ll make you a custom pie chart. Ed. note: This excerpt from a piece by Feministing Editor Emerita Ann Friedman is cross-posted from her Tumblr with permission. In 2004, the year I graduated college, I had the cliched personal crisis that everyone has when What do I want to do with my life? suddenly becomes a practical question, not a thought exercise. I knew I wanted to be a magazine writer. But I couldn’t afford to take an unpaid internship, and my only experience was in newspapers. I’d also recently started calling myself a feminist, which seemed irreconcilable with being an “objective” journalist.